Recently, Oxfam America, the Natural Resource Governance Institute (NRGI), and the International Budget Partnership (IBP) engaged in a series of learning exchanges to share insights and lessons from our respective Planning, Monitoring, Evaluation, and Learning (PMEL) systems and practices. Participants from all three organizations share an understanding that fiscal governance systems around the world are becoming increasingly challenging, and that many of our strategic assumptions are being called into question. Though efforts to ensure public resources are used to promote inclusive and equitable human development have made some progress, exclusionary fiscal governance, reflecting and contributing to deepening inequality, remains the reality faced by millions of people around the world. Continued advances towards more open and accountable fiscal institutions are not guaranteed, and are already subject to reversal in diverse contexts. To be effective in the future we must reexamine our theories of change (ToC) and assumptions to make sure they reflect emerging evidence and shifting contexts, such as civic space. It also means ensuring that our organizations have in place frameworks, practices, and an organizational culture conducive to adaptive learning and management. These areas are essential to navigating the complex and challenging fiscal governance systems in which we work. The learning exchanges, formatted as roundtable meetings, were conceived of and supported by the Open Society Foundation’s Fiscal Governance Program. The goal was to learn from each other’s experiences to improve our organizations’ approaches and abilities to contribute to change for more inclusive and equitable governance. Core participants were MEL teams from each organization; senior program staff and individuals external to the three organizations also participated. The first learning exchange was centered around what our organizations are learning and how it shapes our work – focusing on ToCs and theories of action (ToAs). We compared our thinking and tried to surface assumptions and introduce relevant evidence produced by our organizations and external sources. We situated the comparison of our strategies and theories of change within a conversation about the deeper drivers of exclusion and inequality, as well as the shifting contexts in which we work, particularly with respect to civic space. At the second exchange, we discussed how our organizations learn through diverse PMEL systems and practices, and honed in on the ‘last mile’ for PMEL – using our evidence and learning to inform decision making. We also wanted this roundtable to be practical, so we intentionally built in space for each organization to workshop a particular PMEL challenge, drawing on the collective insights of all the roundtable participants. Across the two learning exchanges we brainstormed inputs for what might be a common learning agenda. This was based on questions we wanted to answer, evidence gaps we identified, and areas of research and learning in which we are already engaged. What emerged was ambitious and needs to be refined and prioritized, but represented a useful map of what knowledge would be most useful for the field going forward. Our organizations are exploring how we might address elements of this agenda individually and collectively, and hope to have further conversations with other organizations in the future. In particular, we began initial discussions of possible geographies in which we may jointly seek to address some of the learning questions we identified. Digging into and distinguishing between ToC and ToA was useful in forcing us into explicit conversations about the systems in which we operate and how we seek to shift them. Comparing our thinking, we noticed that our biases about what makes change happen are reflected in our frameworks (e.g. our ToCs frequently emphasize promoting transparency or information disclosure as a solution to the problems identified). In addition, the Fiscal Futures conversations have highlighted the big question marks, assumptions, and black boxes in our thinking. For example, we are seldom explicit about the drivers of inequality and exclusion, nor how these connect to each other. Our focus tends to be on getting the right government policies, yet implementation can be just as hard or more so. Much evidence suggests that it is the underlying political and power dynamics that shape these possibilities, but we are seldom focused on the longer processes of shifting these structural elements. What does it take to shift systems towards inclusiveness, accountability and equity, and what are the most relevant roles for our organizations and allies? Honest conversations that took place during the learning exchanges pointed to the need for more field-wide efforts around evidence, learning, and ToCs. We even floated the idea of a shared ‘generic’ fiscal governance ToC that each organization could then tailor to their own contexts and nest their specific ToAs within. We fairly quickly realized that we are all facing a similar set of challenges around PMEL, making this exchange highly relevant to all of us. We agreed that the significant new challenges of changing external political contexts and closing civic space reinforced the need for critical reflection and meaningful utilization of evidence-based learning in our respective organizations. Now, more than ever, we need to foster organizational cultures, systems, and practices that enable and encourage tough questions about our efforts and require evidence to support strategic decisions in situations of complexity. Hearing about how each organization is building their overall PMEL system, as well as experiences of putting in place specific tools and practices, gave each organization ideas and insights. For example, IBP is currently in the process of developing an organizational PMEL policy, and the feedback and experiences of the other organizations helped us think about what was useful and realistic. Similarly, NRGI recently launched an external evaluation aiming to inform its 2020-24 strategy, and received useful advice on how to maximize the evaluation’s relevance to the strategy development process. Much of the learning exchange was spent hearing about how we negotiate useful PMEL, i.e. PMEL that meets our requirements (including for donor reporting) but more importantly, that meaningfully shapes our decisions and practices – the ‘last mile’ of PMEL. 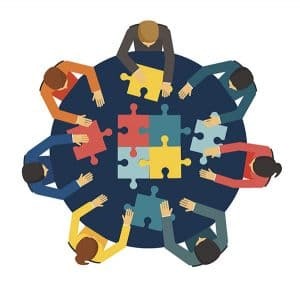 It also means thinking about the formal and informal dynamics and relationships that connect PMEL teams, program teams, and organizational leadership. This ‘last mile’ conversation was perhaps the most enlightening, as we realized that PMEL in each of our organizations is an evolving, negotiated, political, and to a certain extent, contested, domain. Thus, our teams often spend as much time building relationships, trust, and understanding with others in our organization as we do on formal systems and frameworks. We agreed that this was not only necessary, but also desirable to foster internal buy-in for PMEL. The two learning exchanges were extremely useful for all involved. We realized the value of collaboration and some kind of learning community of practice to facilitate the exchange of ideas and practices, as well as to build relationships among PMEL practitioners that allow for honest conversations. This kind of exchange was useful both for sharing practical tools and experiences, and for helping us take a step back to think about the broader challenges and opportunities we face as organizations and as a field. In particular, our shared commitment to ensuring that PMEL in our respective organizations is relevant and bridges the ‘last mile’ to decision making and practice in ways that meaningfully and strategically shape our organizations’ approaches. This includes helping us think about how to sharpen our strategic thinking around how change happens for fiscal justice as well as enabling adaptive management to better navigate the complex and challenging contexts in which we work. Finally, there was an appetite to continue to explore areas of collaboration going forward. Areas we will continue to explore include contributing – individually and collectively – to a shared learning agenda, exploring common ToC elements, and broadening the conversation to other organizations working in fiscal governance issues.